The Bharat Mata temple is truly a unique and one of a kind place of worship. Commissioned by Babu Shiv Prasad Gupta, a former nationalist leader, and Shri Durga Prasad Khatru, a famous numismatist and antiquarian, the Bharat Mata Temple was inaugurated by no other than Indira Gandhi on May 15, 1983. Since then, other branches have been opened in Jabalpur, Jodhpur, Indore, Renukut and Ahmedabad. Situated along the banks of the Ganges River, this temple is dedicated to no specific deity of any religion prevalent in the surrounding religious town of Varanasi. It is simply a 180-foot, multi-storied temple celebrating Mother India. Bharat Mata, or Mother India, is personified as an exceptionally beautiful mother goddess wearing a saffron-colored sari with one hand holding a flag. It is also sometimes accompanied by a lion in paintings and/or murals. This form was first conceptualized in the late 19th century and has since then inspired a play by Kiran Chandra Bannerjee that was performed in 1873. The play was also based on an 1882 novel entitled “Anandarnath” by Bankim Chandra Chatterji that led to the introduction of the freedom song Vande Mataram. The idea behind the construction of the temple was to create a place where the country, India, would be worshipped. It is to remind people that no matter what religion they follow, all should be united under the spirit of nationalism and secularism. So, instead of statues or figures of various gods and goddesses typical in places of worship, the Bharat Mata temple has a large map of an undivided India carved out of marble featured inside the temple. The unique architectural design added charm to the temple, which stands on five pillars that symbolizes the major elements of creation: earth, wind, fire, water and sky. These pillars meet at the top, signifying its unity with the supreme or highest powers. Each floor of the temple represents a particular era in Indian history from the epic Ramayana up until the days of India’s independence that will surely inspire guests from all kinds of religions. Upon entering the structure, one will see the statue of Bharat Mata in all its glory. 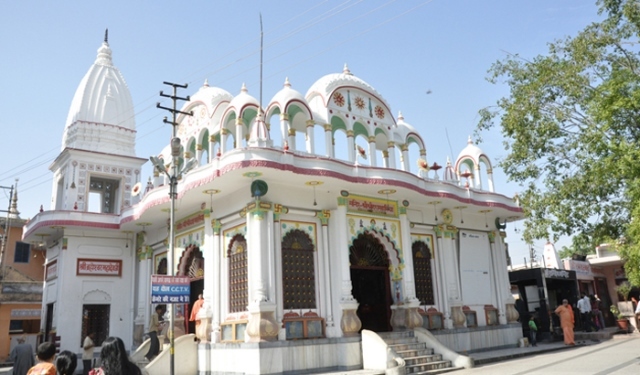 The second floor, called Shoor Mandir, is dedicated to prominent and well-respected heroes of India. The third floor, or the Matru Mandir, is dedicated to the many achievements of the respected women in India like Savitri, Maitri, Meera Bai and many more. The fourth floor, or the Sant Mandir, features the great saints of India from different religions such as Buddhism, Sikhism and Jainism. The fifth floor is where paintings and wall art showcases the various symbolic harmonious relationships of all religions in India. The sixth floor is where various forms of the great divine mother goddess Shakti (Parvati) are featured. The seventh floor is fully dedicated to Lord Vishnu while the eighth floor holds a shrine to Lord Shiva. Tourists and history enthusiasts would surely have a nice time touring the eight-level temple, which is positioned in the Mahatma Gandhi Kashi Vidyapeeth campus near the Smanvaya Ashram. The Bharat Mata Temple stands along the Ganges River in Varanasi and is open daily from 9:30 in the morning to 8:00 at night.